The Covenant Car Company Inc. (TCCCI) - Chevrolet Philippines revitalizes the fun this summer as it introduces the new 2013 Chevrolet Spark. The smart and fun car that provides the unique combination of style and function is rejuvenated with interior and exterior upgrades. What better way to compliment your hot summer getaways than to cruise the road driving the stylish new 2013 Chevrolet Spark. The Chevrolet Spark is a vehicle nameplate that is synonymous to the word FUN. Known for its sporty athletic look and a wealth of amazing features, the Chevrolet Spark provides optimum driving experience that makes every road trip fun and exciting. With the 2013 Spark’s enhanced grille and fog lamps, the mini passenger car exudes more attitude than ever. Its 14 inch, 10 spoke alloy wheels projects a sleeker and bolder stance that is sure to make heads turn. The rear design of the Spark is improved through the new LED mounted spoiler lamps and clear lens tail lamps. Its interior is enhanced with a new seat trim design and silver accents in various key instruments of the car. The modifications add class to the overall aesthetic design of the Spark. The globe was the Spark’s proving ground – its engine was tested and approved by the people of the world. Because the Spark is built on a global standard platform, it tackled some of the most difficult and demanding international terrain – city streets with hills included. Equipped with a 1.2 or 1.0L engine the Spark is capable of delivering a maximum output of 22km/L fuel efficiency rating. The result is based on the fuel run test conducted by Roadwise - a 3rd party agency recognized by the Automobile Association of the Philippines (AAP). Though categorized as a mini-passenger car, the 5 door 2013 Chevrolet Spark provides a spacious interior that can accommodate up to 5 adults. It is designed with passenger comfort in mind while still offering great cargo space. The Spark’s 2nd row seats are capable of a 60:40 folding split ratio that accommodates payloads that have unusual shapes and sizes. The 2013 Spark still comes in 3 amazing variants: 1.2L manual transmission, 1.0L manual transmission and 1.0 automatic transmission. As a treat to would be buyers, even though with the upgrades, all three variants retain their 2012 prices. P548,888.00 for the 1.0 MT and 598,888.00 for the 1.0 AT and 1.2 MT. The Chevrolet Spark is packaged with a 5 year or 100,000km whichever comes first warranty program and a free 3 year Roadside assistance service. This provides new Chevrolet Spark owners the peace of mind that their vehicle is built with quality and service commitment from the brand. The Spark comes in 7 eye catching colors: Switchblade Silver, Carbon Flash Metalic, Green Cocktail, White, Honey Yellow, Urban Titanium Grey and Pink. The launch of the new Chevrolet Spark could have not been timed more perfectly as summer is the season of fun and travel. Summer road trips are bound to be more enjoyable with the Chevrolet Spark’s cool sleek design and wealth of amazing features. To go along with the summer theme, Chevrolet Philippines introduces new vibrant colors that add character to this fun and exciting vehicle – said Atty. Albert Arcilla, President and Managing Director The Covenant Car Company Inc. – Chevrolet Philippines. 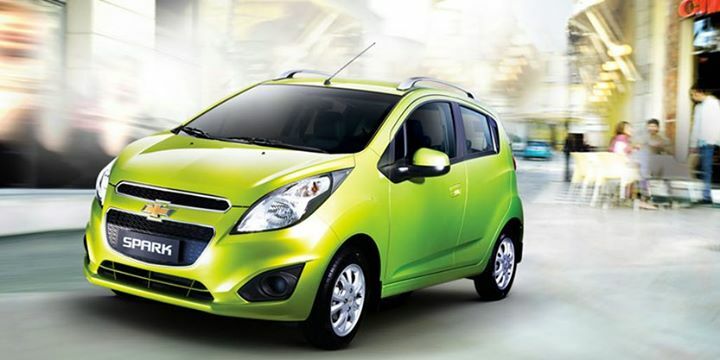 To know more about the 2013 Chevrolet Spark, visit your nearest Chevrolet dealership or log on to www.chevrolet.com.ph.